Newly found manuscript gets hot sales because prior work is iconic and was made into a soul-touching movie. Is this sequel/prequel any good? 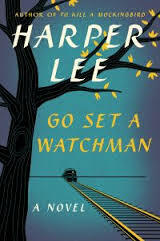 Go Set a Watchman takes place maybe 20 years after To Kill a Mockingbird, but it was written first – I tried to understand it that way, but it gets a bit complicated. Anyway I sure wasn’t expecting much, but as often happens when my expectations are low, I’m pleasantly surprised. This time however, I was somewhat disappointed. I guess I already knew the “bad” stuff – rejected, unpublished, lost 1st novel in which Lee presents our beloved Atticus Finch as a die-hard racist of the 1950s. The book is surely of it’s time and place – where Atticus Finch was a bit out of step with the community of Maycomb in To Kill a Mockingbird, which takes place in the 1930s, it’s now Jean Louise (Scout) who is marching to a different drummer in Go Set a Watchman. Is it possible that a man who stood up against the wrongful conviction and execution of a black man in the 1930s to be against Civil Rights as enforced by the Federal government in the 1950s? Of course it is – or it was. In today’s thinking racist is sometimes racist with no varying shades or complexities historical or otherwise. If the characters in the books are viewed as one and the same guy, then Atticus Finch turns out to be a very complex man, and definitely one of his place. Yes, I belive Harper Lee wrote this book – yes, I believe it probably was not publishable as it was written. Yes, I believe the manuscript was lost for many years, then found but forgotten again, and found again by someone different. I hope Lee gets all the bennies she so richly deserves.